But another story involving Draper reflected less credit on Draper’s bluster. The story — repeated by Supreme Court Justice David Davis — was that Draper paid Mary Todd Lincoln the same sum that Mrs. Lincoln had demanded — $20,000 — in order to be appointed as Collector of the Port of New York.6 Draper received the appointment on September 7, 1864 after his predecessor, Hiram Barney, had been forced from his post. “Shortly after becoming collector, Draper also won the valuable privilege of selling the cotton that General [William T.] Sherman had captured in Savannah in December 1864,” wrote historian Michael Burlingame.7 Although there was great competition for the post, there is no other testimony that Mary Todd Lincoln had any influence on the appointment — which was designed to mollify the Weed-Seward wing of the Republican Party. These important preliminaries, go on without the friends, the sure friends of Mr Lincoln being consulted or notified. When I had the pleasure to see you last, I had no Idea that my name would come before you directly or indirectly for any appointment whatever. I was in Washington on a matter of comparitive [sic] unimportance, and frequently came in contact with Senators, and Representatives, as well as officers of the Government representing the different departments. In a careful comparison of the Individual and representative opinions of those I saw I came to the conclusion, that, the over confidence of some, and the deception, not to say perfidy of others, was leading us into a most dangerous inactivity, and promised to destroy our hopes of success in the great struggle before us, acting under this fear and belief, I made a call upon you and became acquainted with your friend, In accordance with the note of approbation which I struck in these Interviews, I commenced the patriotic service as I esteemed it of bringing forward the organization of a ‘Union Lincoln Association” I think there can be no two opinions as to the character of the men who came forward and lent their names to the motive, and the organization which was established, by the union of good men, in a good cause. The work that has been done gives evidence of the necessity of the organization, and the work that is to be done needs the encouragement of every sympathizing friend in the Union. We need as early as practicable evidence of recognition, and support from the Administration, in the most politic form it can be had. As to my name in connection with the Collectorship, I hope sincerely that it may not be permitted to embarrass you, I assure you upon the honour of a man, I had not the least thought of an appointment of any kind, I had no knowledge whatever of any Custom house dificulties [sic] which promised to result in the vacancy now anticipated, and nothing would be more in violation of my own feelings than to even ask it at your hand. I am ready to meet any complaint at a minute[‘]s warning, as to my personal or public carreer [sic] . I am ready to be tried by a jury of my Enemies, if I have them, In open day and without counsel. but I am not willing to be buried beneath the calumnies of those whose success in dishonest action has made them chiefs of Bureaus in high quarters. The conference of [Henry J.] Raymond and [New York businessman Isaac] Sherman with him this morning of course apprised him that the step was in contemplation. I do not know through whose instrumentality it was, but somehow Mr. Draper has been informed that you were thinking of appointed him Surveyor, and he and some of his friends are stirring up a new difficulty by announcing and insisting that he will decline it. I enclose a letter to you on the subject from Draper’s bosom fiend, Moses H. Grinnell, who had just brought it to Mr. Weed to be forwarded to you when I saw him. My impression tonight is that you will do best to adhere to your original programme, although Mr. Weed and some of his friends have mooted the proposition to make [George] Dennison collector, Draper Naval Officer, and Wakeman Surveyor. Weed told me this afternoon that he thought Draper would agree to this. I am also informed that Wakeman would be satisfied with it. “Lincoln lost no time in utilizing the Custom House,” wrote Carman and Luthin. 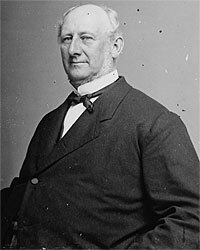 “On the day following the accession of the new Collector, the President instructed Draper to aid the New Jersey leader, former Governor W.A. Newell. Utmost excitement prevailed among Custom House employees, who feared that their official heads were by no means safe under the new regime. There were, indeed, some removals of deputy collectors, weighers, inspectors, and debenture officers immediately upon the appointment of Draper. These few dismissals seem to have been sufficient to bring all into line. ‘It is remarkable to note,’ one New York reporter observed, ‘the change which has taken place in the political sentiments of some of these gentlemen within the last forty-eight hours — in fact, an anti-Lincoln man could not be found in any of the departments yesterday. '”15 Draper himself did not last long in the Collector’s job. After his resignation in 1865, he became a federal cotton agent for New York City. Michael Burlingame, editor, At Lincoln’s Side: John Hay’s Civil War Correspondence and Selected Writings, p. 187 (Michael Burlingame, “Mary Todd Lincoln’s Unethical Conduct as First Lady”). Gideon Welles, Diary of Gideon Welles, Volume II, p. 219-220 (January 3, 1865). Thurlow Weed Barnes, editor, Memoir of Thurlow Weed, Volume II, p. 483. Michael Burlingame, The Inner World of Abraham Lincoln, p. 303 (Diary of John Hay, February 13, 1867). Margaret Leech, Reveille in Washington, p. 301 (Diary of John Hay, February 13, 1867). Michael Burlingame, The Inner World of Abraham Lincoln, p. 333 (Diary of Orville H. Browning, July 3, 1873). Michael Burlingame, editor, At Lincoln’s Side: John Hay’s Civil War Correspondence and Selected Writings, p. 188 (Michael Burlingame, “Mary Todd Lincoln’s Unethical Conduct as First Lady”). Michael Burlingame, editor, With Lincoln in the White House: Letters, Memoranda, and Other Writings of John G. Nicolay, 1860-1865, p. 154 (Letter to President Lincoln, August 29,1864). Abraham Lincoln Papers at the Library of Congress. Transcribed and Annotated by the Lincoln Studies Center, Knox College. Galesburg, Illinois. (Letter from Simeon Draper to William P. Dole, March 3, 1864). Abraham Lincoln Papers at the Library of Congress. Transcribed and Annotated by the Lincoln Studies Center, Knox College. Galesburg, Illinois. (Letter from Simeon Draper to Abraham Lincoln, March 3, 1864). Harry J. Carman and Reinhard H. Luthin, Lincoln and the Patronage, p. 280. Frederick J. Blue, Salmon P. Chase: A Life in Politics, p. 241. Harry J. Carman and Reinhard H. Luthin, Lincoln and the Patronage, p. 281. Justin G. Turner and Linda Levitt Turner, editor, Mary Todd Lincoln: Her Life and Letters, p. 285 (Letter from Mary Todd Lincoln to Alexander Williamson, November 19, 1865). Justin G. Turner and Linda Levitt Turner, editor, Mary Todd Lincoln: Her Life and Letters, p. 285 (Letter from Mary Todd Lincoln to Alexander Williamson, December 17, 1866). Justin G. Turner and Linda Levitt Turner, editor, Mary Todd Lincoln: Her Life and Letters, p. 199 (Letter from Mary Todd Lincoln to Simeon Draper, January 26, 1865).